RICHMOND, Va. (Legal Newsline) -- Mark Obenshain, one of two Virginia lawmakers vying for the GOP nomination for state attorney general, has the support of U.S. Rep. Bob Goodlatte. Goodlatte, a Republican who has represented Virginia's 6th Congressional District since 1993, endorsed Obenshain Monday. 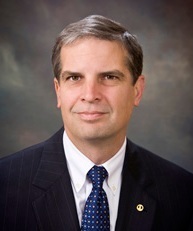 Obenshain, who was elected to the state Senate in 2003, is running against state Delegate Rob Bell for the Republican nomination. The state GOP will decide on its nominee at a May 18 convention in Richmond. "It is with great excitement and anticipation that I endorse Mark Obenshain for attorney general of the Commonwealth of Virginia. Not only do I know Mark on a professional level, but I have had the privilege of calling him a close, personal friend for many years," Goodlatte wrote in his endorsement, published on Obenshain's campaign website. "From listening to his ideas about new and innovative plans for the future of Virginia, to witnessing firsthand how effective he is as a state senator, to sharing his conservative values, I can say without reservation that he will make a great attorney general." Goodlatte called Obenshain's passion for public service a "lifelong calling," pointing to Obenshain's father, Richard, who served as chairman of the Republican Party of Virginia and was later appointed co-chairman of the Republican National Committee. "Mark is both an accomplished legislator and an acclaimed attorney, so he understands very well just how important the position of attorney general is to the Commonwealth of Virginia," Goodlatte said. "One of the founders of the Virginia-based law firm, Lenhart Obenshain PC, Mark has represented Virginians for over 25 years on a broad range of issues." He continued, "I have had the unique perspective of getting to know him at this professional level as a fellow Virginia attorney myself, and cannot think of a more principled and experienced conservative to tackle the issues that face our great state in the future." Virginia Attorney General Ken Cuccinelli, who took office in 2010, is seeking the GOP nomination for governor. Want to get notified whenever we write about Republican National Committee ? Sign-up Next time we write about Republican National Committee, we'll email you a link to the story. You may edit your settings or unsubscribe at any time.